This is a mosaic of the images covering the entire sky as observed by the Wide-field Infrared Survey Explorer (WISE), part of its All-Sky Data Release. The sky can be thought of as a sphere that surrounds us in three dimensions. 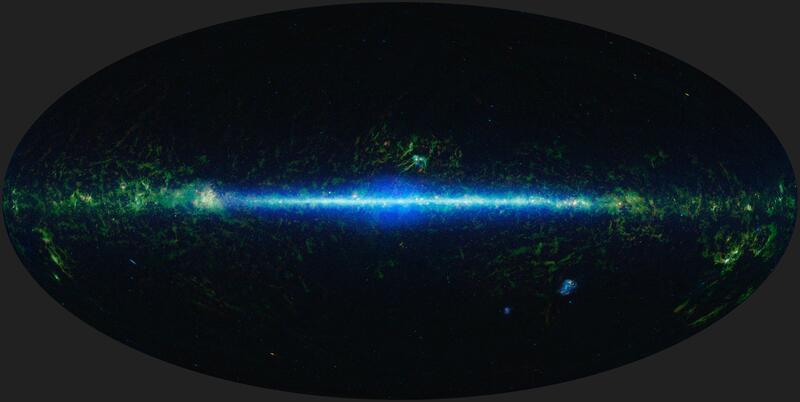 To make a map of the sky, astronomers project it into two dimensions. Many different methods can be used to project a spherical surface into a 2-D map. The projection used in this image of the sky, called Aitoff, takes the 3-D sky sphere and slices open one hemisphere, and then flattens the whole thing out into an oval shape. 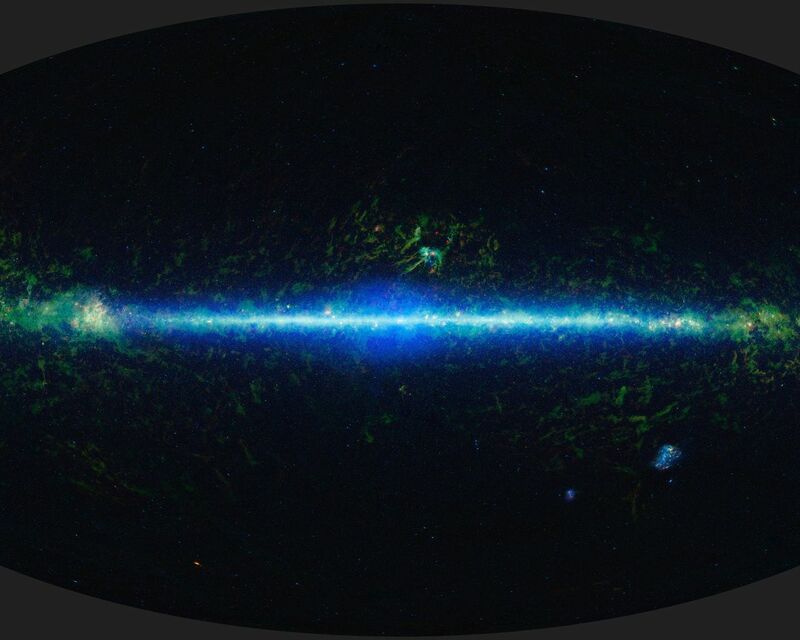 In the mosaic, the Milky Way Galaxy runs horizontally across this map. The Milky Way is shaped like a disk and our solar system is located in that disk about two-thirds of the way out from the center. 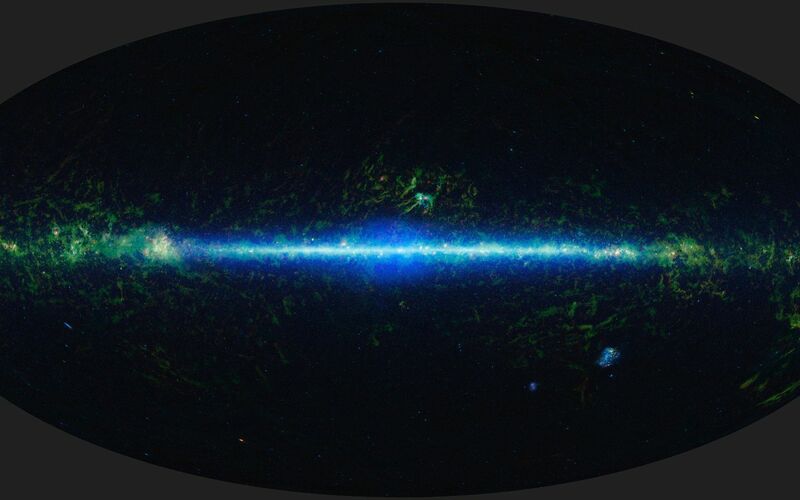 So we see the Milky Way as a band running through the sky. As we look toward the center of the galaxy, we are looking through more of the disk than when we are looking at large angles away from the center, and you can see a noticeable increase in stars (colored blue-green) toward the center of the image. There are some artifacts worth noting in the image. For the image atlas, moving objects such as asteroids and comets were removed. However, some slower moving, bright objects did leave behind residuals. Residuals of the planets Saturn, Mars, and Jupiter are visible in this image as bright red spots off the plane of the Galaxy at the 1:00, 2:00 and 7:00 positions, respectively. In addition, at several locations in the image there are small rectangular shaped features that result from the difficulty in matching background levels of individual atlas frames. Three of the four wavelengths surveyed by WISE were used to create this image. The colors used in this image represent specific wavelengths of infrared light. Cyan (blue-green) represents light emitted predominantly from stars and galaxies at a wavelength of 3.4 microns. Green and red represent light mostly emitted by dust at 12 and 22 microns, respectively. NASA's Jet Propulsion Laboratory, Pasadena, Calif., manages, and operated WISE for NASA's Science Mission Directorate. The spacecraft was put into hibernation mode after it scanned the entire sky twice, completing its main objectives. Edward Wright is the principal investigator and is at UCLA. The mission was selected competitively under NASA's Explorers Program managed by the agency's Goddard Space Flight Center in Greenbelt, Md. The science instrument was built by the Space Dynamics Laboratory in Logan, Utah. The spacecraft was built by Ball Aerospace & Technologies Corp. in Boulder, Colo. Science operations and data processing take place at the Infrared Processing and Analysis Center at the California Institute of Technology in Pasadena. Caltech manages JPL for NASA. 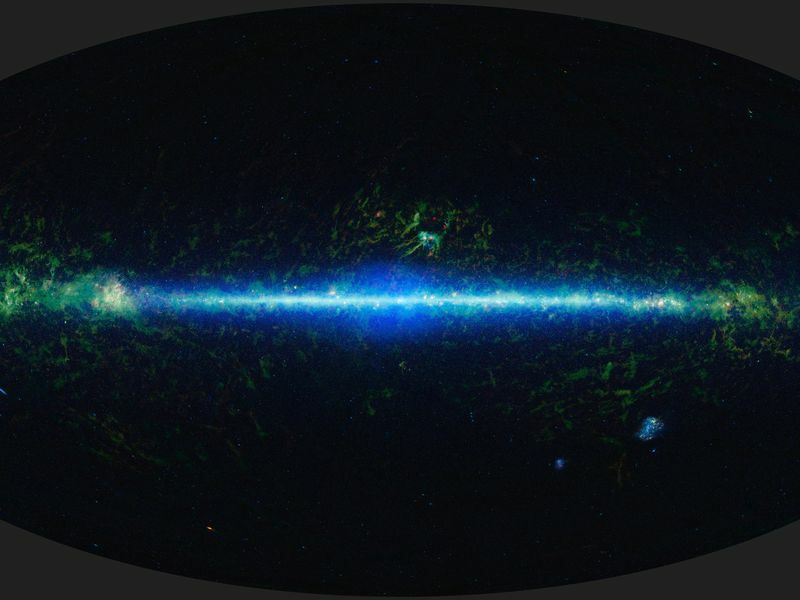 More information is online at http://www.nasa.gov/wise and http://wise.astro.ucla.edu.